A couple of weeks ago, I made a post about having recently joined Instagram, and a competition that was being held to draft a new member of something called the Ligature Collective. The competition was to make a piece to celebrate their success on Instagram, and the best submission would lead to the creator becoming a member of the team and have their work displayed to a large audience. Well, I had sketched up a quick piece, which I posted a fortnight ago, but since then, I had much more time to dedicate to a better thought out piece. My main goal with this piece was to create a visually interesting piece with lots of little details, but to have a very clear hierarchy, such that the piece was structurally simple. Seeing as the piece was going to be posted to Instagram, it had to work at a small size, and be easily identified. 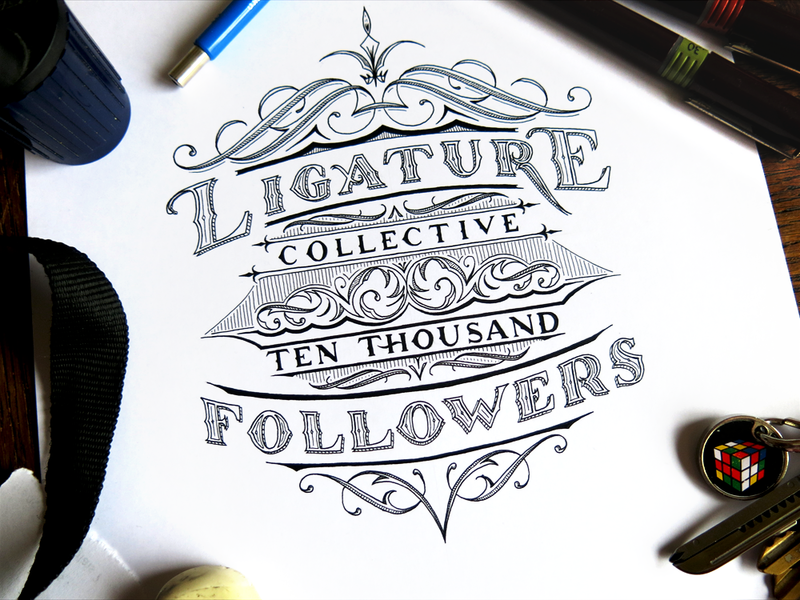 The words “Ligature” and “Followers” worked well as the emphasised words, seeing as they were not only easily legible on small Instagram thumbnails and conveyed the essence of the piece, but also tied the piece up at each end. The piece is symmetrical down through the middle (apart from the words themselves, of course,) and it also has a vague structural symmetry horizontally, too. The words “Ligature” and “Followers” are in the same style, and curve around the piece in the same way, while the smaller central words reflect each other’s style and layout too. The piece ended up being quite small. I took several photographs of it just on the page on its own, but it always ended up seeming as though it was bigger than it really was. I decided to put some other items in the picture that I uploaded to give a sense of scale. The photograph seemed a little unbalanced with only the lettering piece and a single pen, however, so I scattered a few other objects around it to frame it. Some things, like the camera strap and the rotary lead pointer might not give a very good sense of the size of the piece, but the pens and lead holder should do. Incidentally, these were all things used to make the piece, aside from the keys, of course. But with the keys there, at least I get to show off my funky Rubik’s cube key ring. After all is said and done (or just done, really; being a letterer is a pretty silent job) the results will be out tomorrow, on April the 7th. There were some truly excellent submissions among the hundreds submitted by other artists on Instagram, so I wouldn’t be at all surprised if they should win. Good luck to everyone else – I’m sure they’re waiting with bated breath for the announcement of the winner. If you’re curious to see the other submissions, click here, or search for “#Ligature10k” on Instagram! This entry was posted in Uncategorized and tagged Art, Black and White, Calligraphy, Detail, Drop Shadow, Fineliner, Flourish, Hand lettering, Hatching, Ink, Inlay, Instagram, Jack Standbridge, Lettering, Ligature Collective, Ligature10K, Micron, Ornamental, Ornamentation, Rapidograph, Roman, Rotring, Serif, Swirl, Technical Pen, Type, Typography, Word art. Bookmark the permalink.